This scripture conjures up so many familiar images for us doesn’t it? Even those outside the sheepfold probably recognize this quote and can finish it, “The Lord is my shepherd…” It brings up images of soft fluffy lambs and Jesus carrying or leading them somewhere. However, for me, as one of the “lost sheep” for much of my life, it brings to life something more like this image. That is me. That little black sheep wrestling to get out of the briar patch. 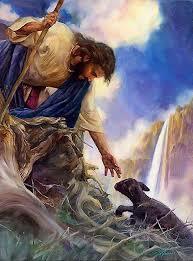 And there is my faithful shepherd, having left the other “good” sheep, to come out and rescue me again. Logic says He should have left me out there on my own. After all, there is no guarantee that I won’t go straying off on my own again – getting into other trouble regardless of what He does to keep me safe. But He loved me so much that He searched for me, picked me up, cleaned me off, and carried me to a place where I could be a part of His flock – safe and secure. He even changed my appearance to be as white as snow, so I wouldn’t be embarrassed there with the others. He had compassion for me, the lost sheep, even when I didn’t even know Him. And He sacrificed everything that I might be rescued. How thankful I am that Jesus is my Good Shepherd. Where would I be without His grace and mercy? How about you my friends? Where would you be with Him chasing after you? Reading this chapter makes me sad. Although a couple of Jesus’ greatest miracles are documented here, the thing that strikes my heart today, is how much the world expected of Him. I have read Matthew several times, but I don’t think I realized until today that Jesus was grieving when these people crowded in on Him. Twice He tried to leave and be alone, but people kept following Him. It seems that when He needed someone to minister to His needs, there was no one that cared to lay their own problems aside and be there for Him. So He sought solitude. He sought the comfort of the Father’s presence. He was purely human. Where do you go when you are overcome by grief or sadness? Where do you go when you need someone to listen? I fear that I am much like the people in this story. Too concerned with my own needs to worry about taking care of others who are hurting. But I don’t want to be that way. I very much want to be a friend when people need it. If anything, this story reminds me that everyone has problems, and everyone has hurts. And I am called as a believer to care for my brother at all times. Fill me with Your Spirit and compassion. Even in Your grief, You still continued to minister. But I know there are times when people just need to be loved. Help me to not be so self-consumed. Help me to be a lover of people. Show me how to be a friend at all times.